To an extent, so many people have been tagged with the title, “AntiChrist”. There have been a number of futile attempts to identify him: Was it Emperor Nero? Napoleon Bonarpate? Adolf Hitler? Josef Stalin? Pope Francis? Henry Kissinger? Mikhail Gorbachev? Again, politicians such as George W. Bush, Tony Blair, Barack Obama, the EU’s José Manuel Barroso, Vladimir Putin, Arnold Schwarzenegger, Osama Bin Laden, from Pope John Paul II to Pope Francis Benedict and even royal family members such as Prince Charles and Prince William have not been spared as the possible AntiChrist. All kinds of ideas and permutations have been proposed, but the world is yet to see all the criteria fulfilled. ALL of these suggested names are just speculations. In fact, as arrogant, lawless, merciless, vengeful, inhumane and wicked as some of these people may have been, you would have to check if they fit exactly as the Bible describes who the antichrist would be. There is so much anticipation in the air and many people are doing their best to predict what is going to happen next. We have already had the 9/11 World Trade Center collapse, the MH370 Missing plane, the MH17 Shot down plane, ISIS, Boko-Haram Attacks, Israeli–Palestinian Conflict, Unknown Virus attacks, Ebola Plague; then there are Internal Security Threats, etc. What is all these about? Chaos? More than chaos. All the world religions look at all these events and following their religious books and beliefs, there is anticipation; The Jews are expecting their Messiah as foretold in their Book, the Christians are expecting to see the appearance of the Anti-Christ and the Muslims are expecting to see the Mahdi. The whole picture may look as simple as identifying a person, but it is certainly as complex as being able to be very certain that you got your man, I mean the very man! In this article, I will not bother going in depth as to the identity of the Christ, there is no doubt about that for most religions of the world except the Jewish religion, that Jesus is the Christ. The main subject here is “Who is the AntiChrist”? There is no better place for us to discover the true identity of the AntiChrist than the Holy Bible. Why the Bible? It is the place where we were first informed of this person or character. The truth of the matter is that many people think the identity of this character is completely hidden and mysterious, but that is not true, God has revealed him. You must be aware that the Bible clearly defines him as the Beast as well. In fact, we get a better picture of him as the beast than just by the title, “AnitChrist”. The beast is the spirit and the antichrist is the man. The beast in a man makes the man the antichrist. Before we can define or discover the true identity of the AntiChrist, we must describe or know the identity of the Christ. You and I must recognize that Christ is a Spirit, and He is the Spirit of God, the same Spirit that moved upon the face of the deep in Genesis. It was this Spirit that rested upon the Person of Jesus. It was this Spirit who walked and worked in Him so that everywhere Jesus went He was doing good and delivering those who were oppressed of the devil. Even towards the end of his life, David said, “The Spirit of the LORD spake by me, and his word was in my tongue.” [2 Samuel 23:2] He was aware of the fact that the Spirit of the Lord was always upon him because he was always knew he was walking with God. The Spirit was always UPON them and not really WITHIN them. That is highly significant. What major difference do we see between these types of the presence of the Spirit? Luke 1:35 answers this, “And the angel answered and said unto her, The Holy Ghost shall come upon thee, and the power of the Highest shall overshadow thee: therefore also that holy thing which shall be born of thee shall be called the Son of God.” The Spirit being upon will cause the power of the Highest to overshadow or cocoon you and birth something WITHIN you. When this Spirit of God begins to reside within the believer, where exactly does He live? Which part or place? Jesus gave us a clue by informing us that the believer is the Temple of God (John 2:21). This was confirmed by Paul (1 Corinthians 6:19). Going back to Moses’ Tabernacle in the wilderness, where was the Glory of God usually seen in the Temple? The Holy of Holies. After this, we find Jesus to be the only One filled with the Spirit of God (Luke 4:1, Acts 10:38). Then, God repeated what He did with Moses with Jesus. He took that same Spirit that filled Jesus Christ and distributed on the disciples to fill them, too. As Jesus was filled with the Holy Spirit, what were the significant things the Spirit helped him do? Or should I say what manner of people did the disciples become after they were filled with the Spirit? He met the blind and opened their eyes, made the lame to walk, forgive the sin-sick folks, turned mourning into singing, brought light into darkness and so on and ultimately, the Spirit made Him experience resurrection. He was the epitome of goodness! The same can be said of the disciples who got filled with His Spirit. They did exactly the same things as Jesus did. In the same vein, the antichrist spirit will take hold of a man and he will replicate or do all the things that Satan would have done had he been able to physically manifest himself. The serpent’s seed [Genesis 3:15, 2 Thessalonians 2:3]. Ignore all the religions of his ancestors [Daniel 11:37]. “Neither shall he regard the gods of his ancestors… nor regard any god; for he shall magnify himself above all”. His kingdom will be “partly strong, and partly broken” [Daniel 2:42]. His kingdom will be “mingled with the seed of men, but shall not cleave to one another” even as iron and clay don’t mix [Daniel 2:43]. He must have a mouth that “speaks very great things” [Daniel 7:20]. He must be a king [Daniel 7:24; Revelation 17:10-12]. Must be a king of fierce countenance [Daniel 8:23]. Must come from within the territory of the former Roman Empire [Daniel 7:23-27]. He will magnify himself, even to the army of heaven [Daniel 8:11,25; 11:26]. A warfare mastermind [Revelation 13:4]. Believe himself to be God [Daniel 11:36-38; 2 Thessalonians 2:4]. Must be someone who already lived, died, and rises from the dead during the tribulation [Revelation 11:7; 17:8]. Must be one of the “seven kings” mentioned in Revelation 17:10, but also an “eighth king”. Must be “like a leopard” [Revelation 13:2]. He has an image to be worshipped [Revelation 14:9]. He gives a mark to his followers [Revelation 14:9]. All these are just a part of who the antichrist is, but there is more from the intricacies of the Bible. While it is right before our eyes, it is also hidden; it is an open secret. The most important criteria of the antichrist have often been the one that is overlooked among all the clues that identify him. We can easily infer from these Scriptures that the AntiChrist is a spirit. As a spirit that opposes Christ, he will seek to reside in the place where the Christ is supposed to reside – in the Holy of Holies, right in the Temple. From this place, it will rule, control, influence and make the host to do everything and anything that is contrary to the nature of Christ. Christ went everywhere doing good, the AntiChrist will go about doing evil. Just as we see with Jesus, this spirit will take possession of a person, but there is also a very strong trait about this person. His nature is ANTI-Christ. It means this person would have been a follower of Christ at some point. That is, an ex-disciple! This is a person who once had a relationship with Christ, but got offended and turned himself into an enemy. Any believer is a potential antichrist! Remember the #14 from the list above? “Must be someone who already lived, died, and rises from the dead during the tribulation” [Revelation 11:7; 17:8]. What does this mean? He must be someone who was once born again (John 3:3). A born again person was someone who used to live as a sinner, but died to sin and came alive in Christ before turning against Him – “who was, is not …. and shall go into perdition” (Revelation 17:8). “Not me,” you say? Good. Jesus once warned Peter of how the Satan has desired to sift him like wheat. 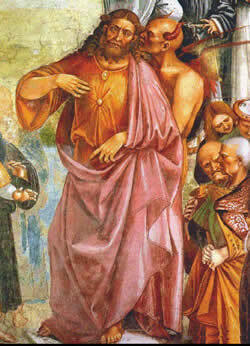 Judas Iscariot must have heard the warning given to Peter and ignored or dismissed it, thinking he was not Peter. This was because he, Judas, was given to the love of this world (1 John 2:15-17). Then he gave place to Satan’s lies and he did not just influence him, he possessed and used him. Judas was the only person in the Bible that Satan entered! He was the only person described as the son of perdition. 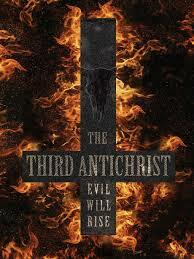 The antichrist would equally be possessed by the spirit of the devil. Revelation 17 verses 8 and 11 describes the antichrist to be a man who shall go into perdition. Paul the apostle had earlier described him as someone who would be drawn into perdition (Hebrews 10:39). Just as the Satan entered into Judas Iscariot, so also shall the beast, the spirit, will enter into a man and make him the antichrist. He would be someone who would choose to pay the ultimate price of destruction because he would sell himself to do evil (2Kings 17:17). Many are still referring to this temple as the one in Jerusalem, making them to miss the understanding by miles! Jesus said the temple is YOU (John 2:21). The sitting and declaration of being a god is in the body of the man, that is within the soul, who is given completely to the service of the devil. When the beast enters and takes possession of the soul of this man, he will become the antichrist and proudly declare himself as God. In conclusion, I would like to encourage you to watch and pray, as Jesus counselled, that you do not find yourself becoming offended at the dealings of God in your life and turning against him (John 6:66, Matthew 26:14-17). Most importantly, we should not be looking out for the arrival of the antichrist, we should be looking forward to the arrival of Christ among His people! NEXT ARTICLE: MARK OF THE BEAST? Wow! This is another piece brother John. But I have some questions. #1. Does this mean there will be one antichrist? #2. Are you saying that the antichrist will come from the Christian fold and not be a Muslim? #3. Is there any specific sign that will tell us that the antichrist is already in the world as some claim? #1. Yes, I believe there will be ONE person who the main antichrist. This is because the devil or any spirit of darkness is not omnipresent like the Spirit of Christ. No one in the kingdom of darkness can be at more than one place at a time, only the Spirit of God can do that. Yes, John the apostle mentioned of many antichrists, but I believe that is as a result of people who have been possessed by different spirits who are opposed to Christ. #2. Yes, I believe the antichrist will come from the “born again” Christian fold, I have explained this in the article that the person will be a FALLEN star, a former friend of Jesus, who will turn against Him (His people). Even if the person is a muslim, check his past, he was a born again Christian who turned away. #3. That is a difficult one, however, he will be marked by his ability to perform miracles and wonders; but the miracles and all that he will be doing will only be for SELF-promotion and would not be glorifying/exalting Christ by them. Brother John, I understand that anyone one of us can be a possible anti christ but my question is will there be a main individual who will carry the embodiment of this evil spirit? Yes, Sister Palm, I believe there will be ONE person who the main antichrist. This is because the devil or any spirit of darkness is not omnipresent like the Spirit of Christ. No one in the kingdom of darkness can be at more than one place at a time, only the Spirit of God can do that. Yes, John the apostle mentioned of many antichrists, but I believe that is as a result of people who have been possessed by different spirits who are opposed to Christ. So do you believe he is here on earth now? Was he born already? That is HIGHLY possible. When you consider the fact of the events of our time, there is no doubt that Christ’s Return is imminent, yet before His Return, the AntiChrist must be revealed. So, he’s already amongst us and either in (or have been in) the Church. Dear Giulio, thanks for your question. I’m sorry to disappoint you for the conclusion you were expecting, which I guess was that I should name a particular person. Well, that was not my intention and besides, as of today, I don’t know who this person is either. However, if you take note of my points, the person would come from the Church-fold, this person may change religions, but it is certain that this person once had a close relationship with Jesus; he had been a disciple and friend, who walked with God. Yet, this person became offended and turned against God, falsely accusing God and pledging allegiance to the kingdom of darkness and he becoming a WILLING tool to resist and persecute all that is Christ’s. If I may add, it is possible that this person will also head an organization with a strong world network that is acceptable to all religions, creed, race and colour. Can you do a research on this type of organizations? Then check the person heading them and begin to check their background, if they were once Christ-followers. If you can pin someone that fits this description, then you have your man (or woman). I hope that should help you in this research. Personally, I am not keen to know who this person really is, I only want to know what God really wants to do with the world. This is because the Bible states that the AntiChrist will be defeated and the kingdoms of this world shall become the kingdoms of our God and His Christ (Revelation 11:5). Blessed be our God. Amen! Alekum Shalom ……………servant of Jacob, Maranatha. You answers amaze me, because you did not cite a single Scripture to back up your claims. How could you be so sure by making so many claims without any Biblical basis. I also wished you laid out your answers clearly as they seem to be jumbled. I will ask a few questions from your statement and hope for simple answers with Scriptural evidence. #1. How is Egypt and Sodom = Jerusalem? Yes, Jesus was physically killed in Jerusalem. But the Bible said this Egypt and Sodom is a spiritual city. How is that Jerusalem? #2. Who is the man that put his name on barcodes? We need more proof than calling him “the beast”. Could you mention his name and support your answer with Scriptures? #3. Are Muslims the only gentiles occupying the Holy Mound? #4. What connection has Christ with Rome as “part potters clay” that does not “cleve”? #5. How is Binyamin Netayahu the man of perdition? What is your Scriptural basis for this assertion? #6. Have you ever meditated on the TRUE definition of the Temple by Jesus and expanded upon by Paul? #7. If Jesus defines the true temple, ever considered that this temple would have an Outer Court, Holy Place and Holy of Holies? #8. Ever considered John 4:23? #9. What was Jesus saying in that Scripture, is this irrelevant to the Book of Revelation? #10. Do you understand the true meaning of the Menorah? Ever read where Jesus defined what the Menorah signifies in The Book of Revelation (as He explained in chapter One)? Dear brother, don’t you think these things are much more spiritual than the way you are concluding it? Remember what Jesus said about the parable of the sower? See Luke 8:10 … And he said, Unto you it is given to know the mysteries of the kingdom of God: but to others in parables; that seeing they might not see, and hearing they might not understand.